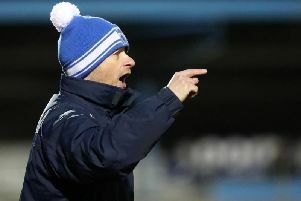 Gerard Lyttle has spoke out following his departure from Sligo Rovers. The former Cliftonville boss was informed on Tuesday night that his contract was not to be renewed with the League of Ireland side, who currently sit in eighth place in the Premier Division. In a statement released on Twitter Lyttle wished the club well, but said he felt the club was 'going in the right direction' and that he was the man to lead it forward. "I would like to thank everyone who was with me since taking over at Sligo Rovers last April," he said. "I moved my family down and have always been made very welcome by the people of Sligo. "It has been a very tough challenge, but one I feel I faced head on. "This season for me was always going to be a tough one with eight or nine Under-19s making their debuts, with three of them going on to play 20 or 30 games I am very proud. "I was brought in to stabilise the club, blood our home-grown talent, and through time start to challenge for European football. "I truly believed I was the man to do that, but unfortunately I never got the time. "I hope I've left the club in a better state. I do believe when a manager leaves a club it should be left with good structures, good players and a foundation for the next manager to build on. I hope I have achieved that. "Football is full of opinions, positive and negative, but for me we were going in the right direction. "I know it wasn't quick enough for some, but it was progress. "People will say players let you down, but I can say no one did. I have loved working with every one of them, it was a learning year for them all. "They are a young group with a young manager, who was always going to make mistakes along the way, but those mistakes would have stood us well for the upcoming season. "I wish Sligo Rovers nothing but success for the future, the loyal fans deserve this. "I also wish the new manager well and I hope he continues on the hard work with the young players." The club will make an announcement on an interim manager for the final 10 days of the season shortly. Reports have linked Liam Buckley with the position following his exit from St Patrick's Athletic last month.